For each and every record there is one and only one record owner. Records can only be assigned to active licensed Salesforce users. When a user is marked inactive, they still own all records assigned to them, but cannot be assigned new records. The terminology â€œrecord ownerâ€ is reflected through Salesforce. 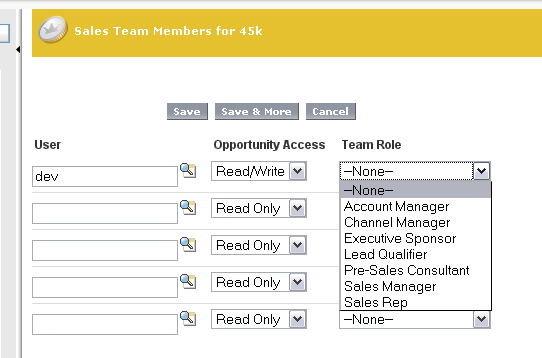 For instance, the â€œMy Opportunitiesâ€ list view refers to â€œopportunity records in which I am listed as the record ownerâ€. Additionally, the role of the record owner is what determines access to that record for the rest of the organization via Sharing Settings. Synchronization applications (Connect for Outlook, Salesforce Offline) will only synchronize records owned by the user by default (two exceptions: sharing groups, if a user owns an account, they will automatically collect all of the contacts regardless of owner). In practice each user should be responsible for all records owned. For instance, sales rep X owns account ABC Finance. Rep X would be responsible for keeping all address information, contacts, and opportunities up to date. Sharing Settings control the default access for each object across the organization. Sharing rules per object can grant access beyond the default Sharing Settings; they cannot restrict access. Grant Access Using Hierarchies is cannot be disabled for standard objects. When this setting is enabled, the role of the record owner determines visibility throughout the organization. Users in roles higher in the hierarchy will be always have full access (view/edit/delete) to all records owned by those lower in hierarchy. If Grant Access Using Hierarchies is not enabled, all roles are treated equally regardless of hierarchy. Notice how even sharing rules are affected by Grant Access Using Hierarchies. Note: Group-based sharing rules do not propagate using hierarchies. Security controls- does the userâ€™s profile have access to this object? Is Grant Access Using Hierarchies enabled for this object? Is this userâ€™s role higher in the hierarchy than the role of the recordâ€™s owner? Grant the highest privileges of all of these steps combined. Roles are a principal element in sharing rules. Users should be grouped into roles based upon their need for access to data- how they fit into the role hierarchy. Creating a role for each title is not required. Roles are accessed throughout the application, and are particularly important for reporting. 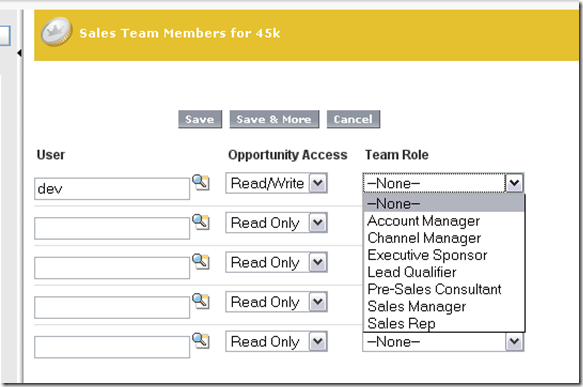 For instance, if you have two groups â€œOutside Salesâ€ and â€œInside Salesâ€ you can run comparative reports to both roles. Roles report to another role. It is a one-to-many hierarchical relationship. ame as running a report but instead of getting results you transfer the record. Note: The sharing button will only appear when a record the Sharing Model for the object is either Private or Read Only. In my developer test account, no objects by default qualified. Click on the record, click Sharing. Select the users/groups and access level to grant. Records are shared as such individually. Public Groups are created by administrators and can be used by everyone; they have the same basic functionality as private groups. A few uses include using a sharing rule (org-wide or record sharing), specify contact synchronization, and add multiple users to a Salesforce Content workspace. Both are Enterprise+ (Enterprise and higher editions only; this includes developer). Click edit or create new on a folder list view.